With the Eurozone recession comes the possibility that by taking a wrong turn, France could easily migrate from the core to the periphery. That is why the upcoming French election is critical to the direction of the euro area nations. France has to start moving rapidly toward a balanced budget before the market begins to view it the same way it views Spain. Sarkozy is quickly positioning himself as a fiscal conservative ready to tackle the problem. The Washington Post: Sarkozy, a conservative, said balancing the budget by 2016 is “an absolute imperative,” and promised a balanced budget law this summer. He said he would do that by cutting €40 billion ($52 billion) in public spending and raising €13.5 billion ($17.6 billion) in new taxes. The strategy is to tell the voters that if they don't vote for him, France will indeed move toward the Eurozone periphery. Some have accused Sarkozy of causing France's relatively high budget deficit to begin with. Others point out that the opposition is not necessarily going to make the budget problems worse. Whatever the case may be, it looks like the opposition from the left is still ahead in the polls, a development that could be destabilizing for the Eurozone. Since the last post on the topic however, Sarkozy has gained some ground. 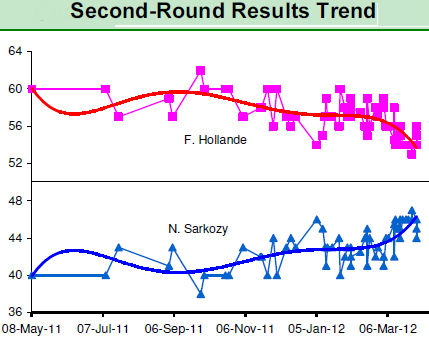 The chart below shows the latest polling trend for the second round of elections (head to head) which is widely expected to be between Sarkozy and Hollande (the Socialist opponent). 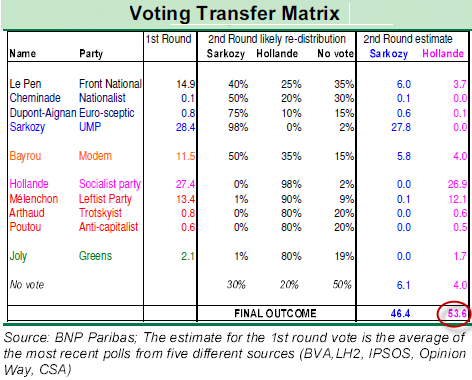 In spite of this trend, BNP Paribas' analysis still projects Hollande to be the winner. In spite of Sarkozy's one point advantage in the first round of elections (28.4 to 27.4), the believe that Hollande will be able to capture the bulk of France's left. In particular he is expected to keep 90% of Melenchon's Leftist's Party, which commands 13.4 percent in the first round. Sarkozy on the other hand is not expected to capture a significant majority of Le Pen's supporters (a somewhat scary group) on the right nor the bulk of the centrist Bayrou's supporters. Hollande's victory is not necessarily a disaster for France, but it will create a great deal of uncertainty and may unsettle the financial markets. Hollande basically has no real experience governing. It is in fact possible he will take France on a spending spree as Sarkozy keeps insisting (France's public spending is already 56% of the GDP). But the most dangerous step at this juncture would be for Hollande to push in a different direction with respect to the latest Eurozone treaty and the ESM. That is why Angela Merkel has effectively said she will "campaign" for Sarkozy. Germany is clearly worried about the Hollande risks and so should the rest of the Eurozone.